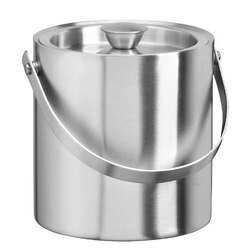 We are offering a wide range of Ice Buckets including Stainless Steel Ice Bucket (Double Wall) that is exquisitely designed for storing ice without melting for a long time. It is having a double wall construction for seamless thermal insulation and has a sturdy construction. We use cutting edge technologies to manufacture these and follow the most stringent quality norms for flawless finish in accordance with set norms of the industry. These are offered at leading industry prices to our clients. 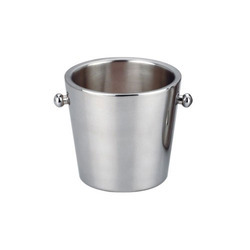 Our immense domain knowledge of manufacturing, supplying, and exporting a large assortment of Barware & Bar Accessories including Ice Buckets has enabled us to present Stainless Steel Champagne Bucket to our prestigious patrons. These are having an elegant design that is sure to enhance appeal of Champagne Bottle and mood of celebration. It is made from the best grades of steel and has an alluring finish. These are provided with graceful handles for improved appeal and functionality. 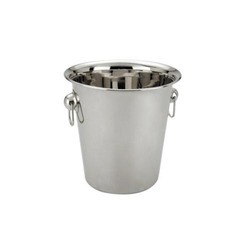 Our esteemed clients can avail a huge gamut of Ice Buckets such as Stainless Steel Ice Bucket that is elegantly designed for storing ice for a long time without melting. It is having a sturdy construction for remarkable thermal insulation and has a stunning shape. It is manufactured by using modern technologies. We maintain rigid norms of quality by adhering to laid down industry standards. Our patrons are offered these at affordable rates. 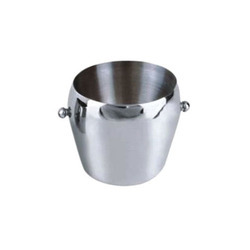 Our excellent range of Ice Buckets is offered to the clients, as per their specific preferences and requirements. 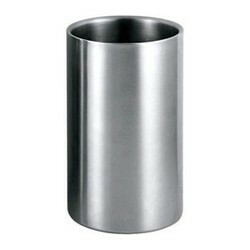 We make sure to provide these ice buckets to the customers in different finishes, sizes and other specifications. In addition to this, we check these products on certain quality parameters and timely deliver the flawless range of Ice Buckets at the clients' end. We are instrumental in offering Wine Chillers to the esteemed clients, as per their specific requirements. These products are widely used by the clients to chill wine bottles at special occasions. Moreover, we offer these products to the clients in varied designs, finishes, grades and other specifications to meet their varied preferences.